Automatic pet feeders are a joy! They save you time, are efficient, clean, and makes feeding your pet worry-free. The Healthy Pet Simply Feed uses an innovative conveyor that dispenses most dry and semi-moist foods, while the locking lid and pet-proof dispenser keeps your pet from accessing the food. Unique features like Slow Feed, Pause Feed and Immediate Feed allow you to change your plans and portions for the right fit. The Healthy Pet Simply Feed stores up to 24 cups of food in its translucent hopper, so you can see when your pet’s food is running low. This feeder is designed for cats and small to medium sized dogs. Digital timer programs up to 12 meals a day with flexible meal portions from 1/8 cup up to 4 cups. Anti-jam conveyor system dispenses dry and semi-moist foods of different shapes and sizes. Slow Feed Mode dispenses meals greater than 1/8 cup over 15 minutes to help prevent gulping and vomiting. Immediate Feed Mode dispenses next scheduled meal instantly and Pause Feed Mode temporarily stops feeding without losing programmed feed schedule. Pet-proof dispenser helps keep out prying paws and locking lid helps keep food fresh and secure. Removable stainless steel bowl is more hygienic for your pet than a plastic bowl. Disassembles for easy cleaning with some dishwasher safe parts. Requires (4) D Alkaline Batteries (not included). Optional power adapter sold separately. It’s a Feeder you can’t live without! 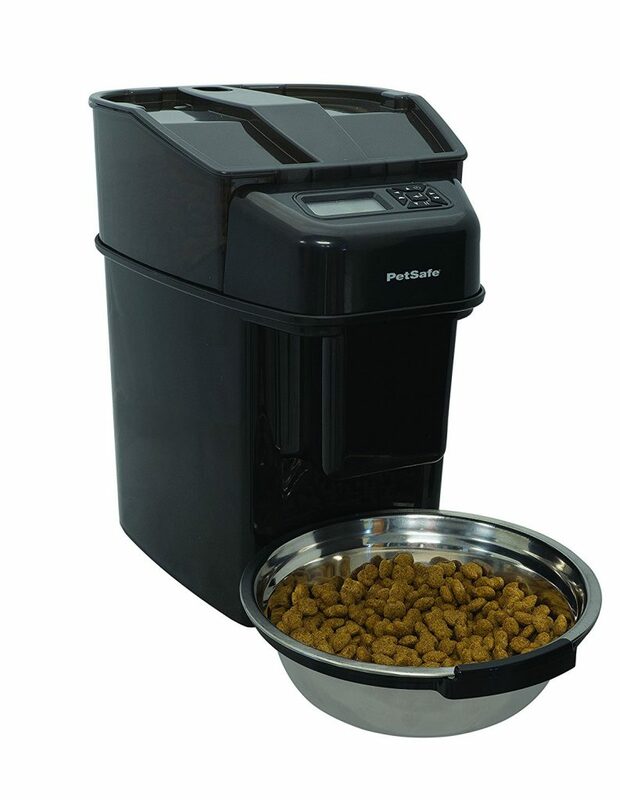 Grab the PetSafe Healthy Pet Simply Feed Automatic Feeder TODAY!